Ensuring nutrition for the world’s burgeoning population is an ongoing concern in many countries. Food is considered a basic human right – yet in a world of billions, there are still many millions who suffer shortage of this vital commodity, or lack of access to good nutrition. There are many areas of action to alleviate this situation such as science programmes, biotechnology, improved animal husbandry, precision farming techniques, genetic modification, agricultural training, subsistence farming, garden farms, hydroponics, etc. But while great leaps of advancement have been made, population growth continues to put pressure on solutions, and new strategies and opportunities must continually be explored. Zero hunger will save the lives of millions of children, families and communities. Mothers who are better fed will produce healthier babies with better immune systems. The costs of attending to child undernutrition would be reduced, thus significantly contributing to improving a developing country’s economy. Early nutrition increases a child’s effectiveness in education, and could also mean far greater earnings potential, and the ability to earn for longer. Iron deficiency can lead to poor production levels, therefore better nutrition is essential to boosting energy, and therefore production levels in the workplace. Work forces will be increased, becoming stronger and more productive – and larger, more active workforces will offer greater opportunities for industry to grow. Greater stability brought about by zero hunger would contribute positively to immigration patterns and rural development, allowing people to feel more settled and secure, able to contribute successfully to their own survival. Zero hunger can help build prosperity for more people, and reduce violence in a world where people should feel safer, healthier, and experience a greater purpose beyond the fulfilment of a basic need. 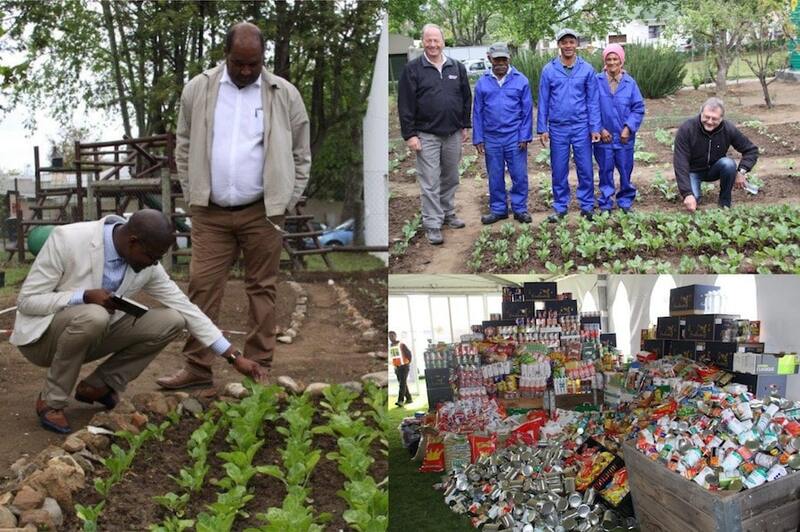 “We decided to make sure that residents were able to grow their own food with limited water.” ~ Alan Winde, Minister of Economic Opportunities, Western Cape. Invaluable training on organic food gardening for community members was provided in a rural/urban setting. All residents received training on how to use grey water and food garden projects were fitted with greywater systems. Community gardens were linked by a pipeline to a borehole water supply, meaning no municipal water would be used. Three new community gardens were established, along with two school gardens. In total 50 families were shown how to benefit from water-wise household gardens, using drip irrigation, greywater systems and rain harvesting tanks. Solutions based on food gardening are ideal for rural farmers – ruling out man-made fertilisers, pesticides and additives, which makes the process more accessible to community members. Once food security is established, a cycle of social economic development can be facilitated, with far-reaching benefits into entire communities. Drip irrigation systems: While there are sophisticated methods entailing sub-surface piping with innovative nozzle designs, poorer communities can use a normal black plastic irrigation pipe bored through with holes and a rope run through the holes and visible on both sides of the pipe. Should this handmade dripper get blocked, one can pull the rope up and down to unblock the system. The beauty of drip irrigation is that it uses much less water, but does deliver a steady drip at a steady pace. Grey water: Make your own greywater-filter by using a plastic bucket and filling it with different layers of rock, gravel, sand and charcoal. Make a hole at the bottom and put a funnel in it. Put a cloth or stocking at the bottom of the bucket to prevent the sand from draining through the funnel. Organic methods: When planting your own vegetables, use organic principles to prevent pests and diseases from taking over. Diversification with different types of vegetables, herbs and insect repellent plants, is optimal for food gardens. With every project, purpose and vision, there is a fundamental need for good oversight. Rural development projects and agricultural initiatives are geared specifically to improve the standard of living of people in rural areas by meeting socio-economic needs and providing greater opportunities for employment. It is therefore vital that motivation and training is encouraged through planned learning curves and continual enhancement of expertise. Sound management skills must be applied to these projects to ensure continued impetus and that the necessary measures are efficiently carried out to achieve the best outcome – which is to ultimately empower vulnerable communities and households with the means of producing their own food. To do this successfully requires management services that are designed with understanding and empathy for the needs of a rural population – while matching these needs with agricultural infrastructure programmes and initiatives that are both practical and fully implementable.